Wow. What a great year for game development in Oklahoma. When we came into the year, there was pretty much no established industry here. 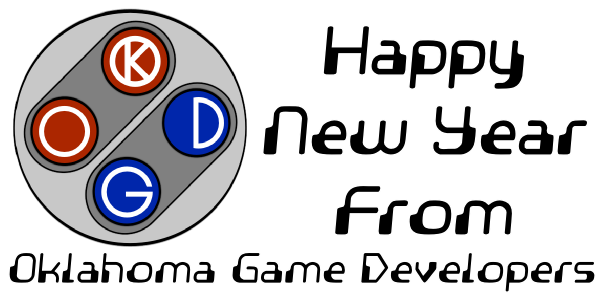 Then 2013 began and we have had an explosion of game development happening in this state. It could all be said to have started with Casino RPG. In January, Goldfire Studios ran a successful Kickstarter campaign for their casino MMO. They raised over $20,000 toward development and have released a great product since then. Spurred by their success, they have helped foster the community of game developers by hosting monthly meetups. These have been a great networking opportunity as well as time to learn new topics and skills. Another success we have seen is with the board game Amerika. This game went to Kickstarter twice and succeeded the second time around thanks to some very creative strategies. It looks like a great looking game and shows us that video games are not the only game arena in town. On the crowdfunding campaign side of things, we have seen a number of attempts at getting games funded. We had Spheroid, StellarBrink, Cymbil Spellcraft, A Wasted life, and more. While none of these games have succeeded at their campaigns, the developers are not sitting idly by. They have continued working toward bettering their games and we will hopefully see more come to completion in 2014. But these crowdfunding games are only part of the grander side of game development in the state. There are plenty of other games being made quietly all the time. Some are being made by individuals, others are being made by small teams. As we learn about these smaller games, we are more excited about Oklahoma’s prospects. 2013 also saw our first real effort as a community of game developers focusing on political activism. Senator Coburn signed on as cosponsor of some problematic legislation authorizing potentially biased studies of game violence. We banded together as a community and wrote a letter to him. While the response we got back was not what we wanted, it put our thoughts out there and made him think. This is certainly something we plan to do more of as needed. Heck, game development in Oklahoma even got featured on TV in 2013. I think this could very well happen again this year. Which brings me to what we are looking forward to in 2014. With so many game developers actively working toward completing games, we can certainly look forward to seeing more crowdfunding campaigns happen in 2014. Many of those will not succeed, but many will. There are markets out there that are waiting for the games Oklahoma has to offer. We also look forward to a year of events too. Not only will we continue to have meetups on a regular basis, we will also have local game jams and expos. There are already several events planned for 2014 with many more in the works. Regardless of what happens, one thing is for sure. Oklahoma Game Developers will continue to report on all these to the best of our ability. We hope to grow and expand as the game development community grows.